Jeremy, Evan, and I had the privilege of attending media day at the Bricktown Ballpark, covering the OKC Dodgers for the Crossover. First off I want to say that the Dodgers are a great organization chalked full of classy people from top to bottom. I am more than excited to have the opportunity to cover the team this year. One common theme which pulsated throughout each interview we had the opportunity to participate in today was character. 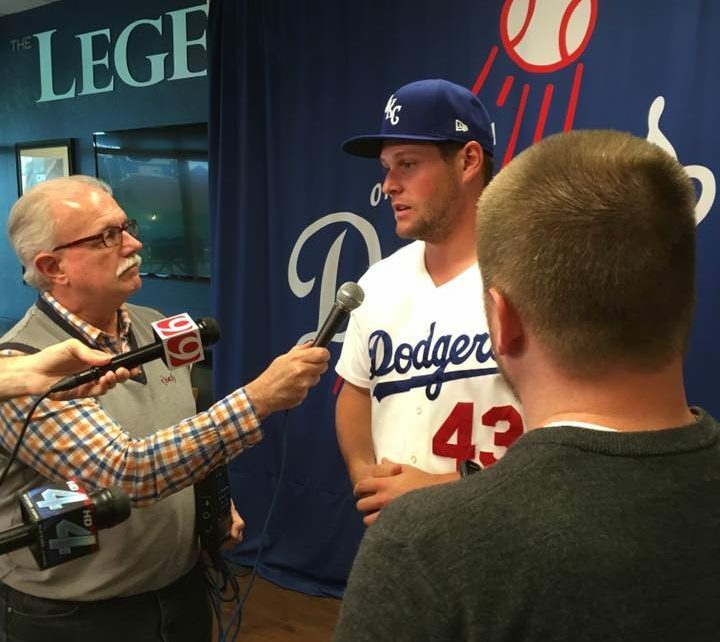 OKC Dodgers Manager Bill Haselman said about his 2017 squad, “I mean I like it. There’s a lot of high character guys on that team.” Haselman reiterated that he has a team full of men with great experience as professionals, but also full of guys who are selfless in the way they band together and help one another. This OKC Dodger organization is simply that way from top to bottom. At the Triple-A level, it’s no secret that every guy wants a chance to get called up to the Bigs. These guys who are playing in OKC today want to be playing in L.A. tomorrow. What amazes me about these guys is that even though they are in a cutthroat profession where guys are moved up, down, and even out based on performance, these guys want to see the men around them succeed. That’s character. It would be easy for these guys to be all about themselves. Each one wants to be the best. One way to rise quickly to the top is for your competition to fail. I never sniffed even a hint of that sort of attitude from any player on this Dodger team. These guys legitimately want their teammates to succeed. They are not looking for the easy way out. Triple-A baseball is fascinating to me. The players are teammates, but in a way they are also competitors. When they rise as a team, it forces everyone to grow and reach higher in order to make it to the next level. That’s why I think this Dodger team has an opportunity to have another great season in 2017. This is truly an organization built on character. The guys care about one another and that attitude comes from the top. Team President ‎Michael Byrnes, Manager Bill Haselman, Pitching Coach Matt Herges; I heard each of these men speak and every one impressed me as a man of character who cares about the guys they have in their organization even more than they care about their individual success. Their job isn’t to win so much as to develop guys for they next level and they know it. Winning is the icing on the cake, developing guys is the cake. Their attitude shows good character. Pitcher Trevor Oaks exemplifies the heart of what makes this team great. When asked about being coachable he said, “there’s a lot of people who know how to do it right in this game, and you want to do it right too.” Oaks further talked about learning from his coaches as well as from his fellow players. His coaches had nothing but positive things to say about him. My favorite thing I heard Oaks say today was when my colleague Jeremy Coleman asked him about what it’s like to be a Christian playing pro baseball. Oaks said, “You’re a Christian first and a baseball player second.” He also emphasized that while baseball is temporary, following Jesus is forever. Well said Coach Herges. In life and in baseball character matters. It separates the great from the average. Good character is what makes the OKC Dodgers are wonderful representative of our great city. I am proud to have them wearing “OKC” on their jerseys and bearing our reputation every time they take the diamond, but also in they way they carry themselves off the field. About the author: Nick Tarter is a CrossOver Online contributor, a pastor at City Life Church in Bethany, OK, and a Church Planting Strategist for the Baptist General Convention of Oklahoma. He is an avid Jeeper, outdoors enthusiast, sports nut, and family man who loves the church, the Bible, and is passionate about theology. Nick holds a Bachelor’s in Humanities and Philosophy from UCO in Edmond, OK and a Masters in Theology from Liberty University.